I couldn’t wait to get my hands on this new book that features the photography of Portlander, Andrea Johnson. I have known Andrea for years, and have found her wine-related photography to be inspiring. This large, hard-bound book of 270 glossy pages includes hundreds of dazzling photographs, including many spectacular aerial shots that bring Oregon's pastoral terroir vividly to life in these pages. 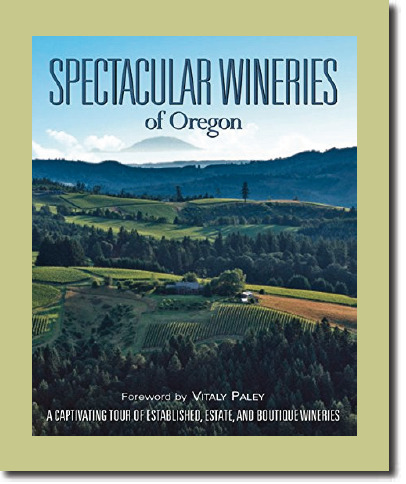 Covering 70 of Oregon’s most notable wineries, the photographs are accompanied by a detailed history of each winery, a portrait of the associated colorful owners and winemakers, and a listing of featured wines with food pairings. After opening the book and perusing a few pages, I was so inspired that I wanted to cancel my plans for the week, grab a flight to Portland, and explore the wineries in the book that I have not visited. I dare you to resist the urge to explore Oregon's wine regions after perusing this collection of photographs. The availability of tastings and visiting hours for each winery are detailed in case you are tempted. A map showing the location of the included wineries would have been welcome. Some of my favorite wineries were not included, but with more than 450 wineries spread over 17 appellations, it is impossible to include them all in one volume. The publisher, Panache Books, also offers companion volumes in its Spectacular Wineries Series that cover the wine regions of California’s Central Coast, Napa Valley, and Sonoma Coast, as well as New York, Ontario, Texas and Washington. This book retails for $49.99, but is discounted at amazon.com and other sources. Get a copy and bring it to the International Pinot Noir Celebration this July in McMinnville, Oregon, where Andrea and the vintners featured in this book will be happy to autograph your copy.